Recently I shared with you a piece of my heritage and royal ancestry. In writing this, I was reminded I once wrote a paper in college about my family history. More specifically, how my parents journeyed to the States. 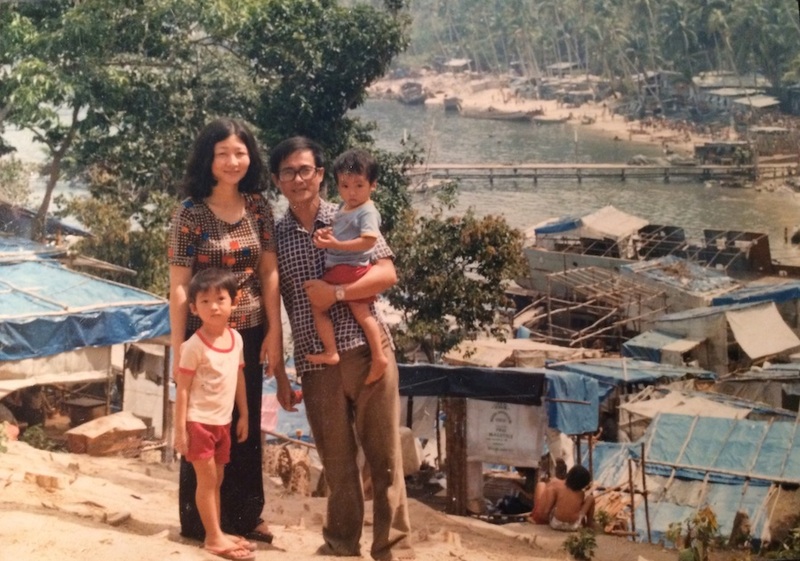 When we were escaping the communist government, we snuck off on small boats in the middle of the night with nothing but the clothes on our back and $100 USD. It was two long grueling days on sea until we reached land in Malaysia. There was no food or water with about 115 people cramped in a space of 10 meters. Everybody had to sit down not ever moving. We had your two older brothers on our laps for this entire period. Thousands died of starvation, dehydration or pirate attacks. 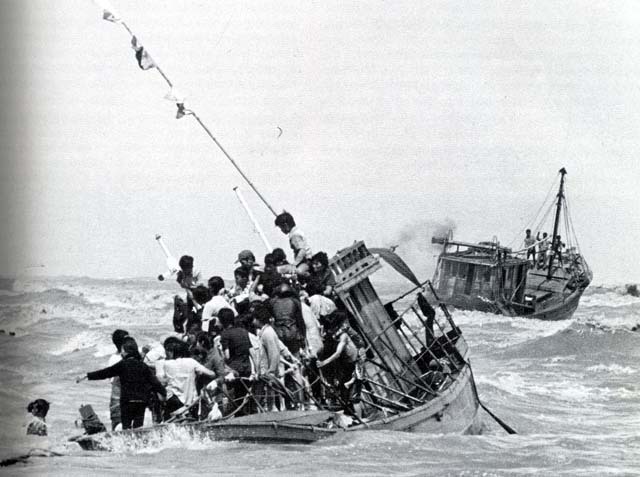 When we finally reach the Malaysian coast, we were turned away by the Navy and were told to go to Indonesia instead. Then we traveled far down the coast to another beach until the engine died. Soldiers approached the boat pointing their guns at us. 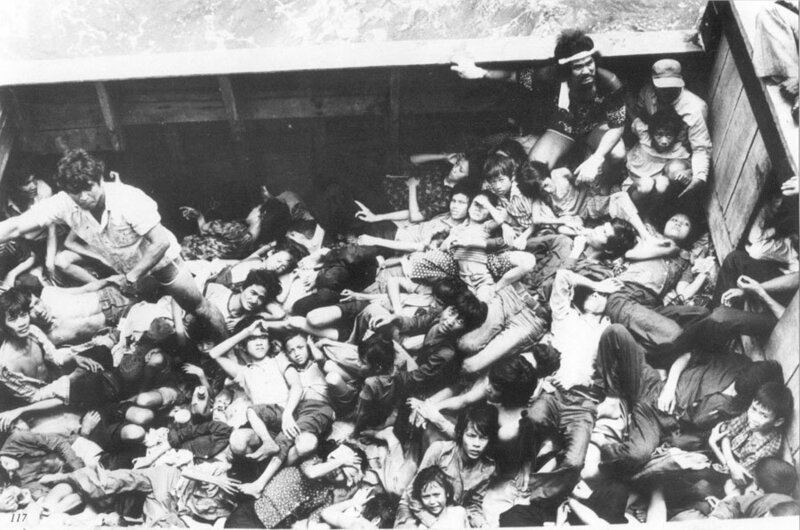 Two young women drowned in the ocean trying to escape the soldiers. My parents then jumped off the boat carrying my two older brothers hoping for the best. Luckily the UN high commissioner for refugees was present and directed the coast guards to let the boat people in. 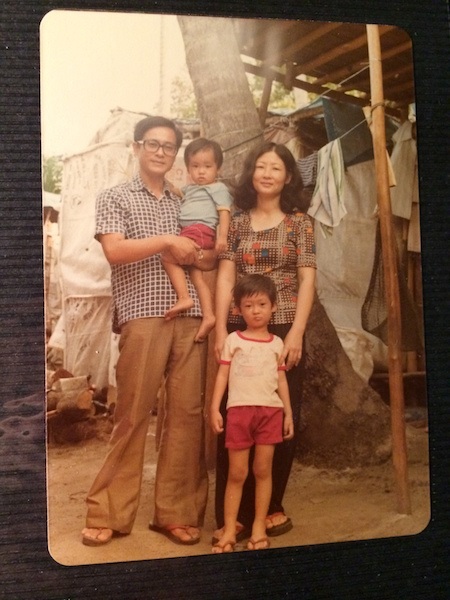 Above picture of my mom, dad and older brothers standing in front of their fancy digs at the refugee camp. Here’s my family again on a hilltop above the refugee camp in Pulau Bidong, Malaysia. After 6 months in Malaysia, my family headed to Hawaii in 1979. My parents finally reached the mainland and settled in California a year later after getting a sponsor. Back then, you had to have family or relative already living in the States to sponsor you otherwise you were not allowed to enter the States. While they fled for freedom, opportunity and the pursuit of happiness, my mother told me most left with the intention of returning; that the departure was only temporary until the communist regime fell. Over the years, they settled in San Jose, learned English and after a few years, got their citizenship. Not long after, I came along! To learn about my parent’s struggles and reasons behind why and how they left has always been hard for them to relive. But they did it for a better life for their family and children. And for that, I am externally grateful for their bravery and safe passage. My first visit to Vietnam help me realized the opportunities they’ve given my brothers and I for raising us in the US. This week is Thanksgiving in America. I am thankful for my parents and their courage and strength to leave everything behind. My mother, the oldest of 6, left her siblings and parents behind along with her career in pharmaceuticals. My father had to do the same leaving his family and his degree in education. All this and not knowing if they’d ever see their loved ones and family members again. Both had to completely start over in a foreign country. I can’t imagine what that feeling must be like. For that, I’m thankful for parents… for the life they gave me. Has your family migrated outside of their mother country? Have you learned about their story? If so, feel free to share in the comments! This gave me chills! My great-grandparents came over from Italy back in the 1910’s and I always wished I could know more of their story. It’s definitely valuable that your Mom was able to share this with you. Love this post so hard. I am fascinated by tales of migration and refugee stories, and I am so pleased that everything worked out well for your family. Here in the UK there is a massive stigma attached to asylum seekers and refugees,which makes me so angry on a daily basis. What a beautiful and haunting story. 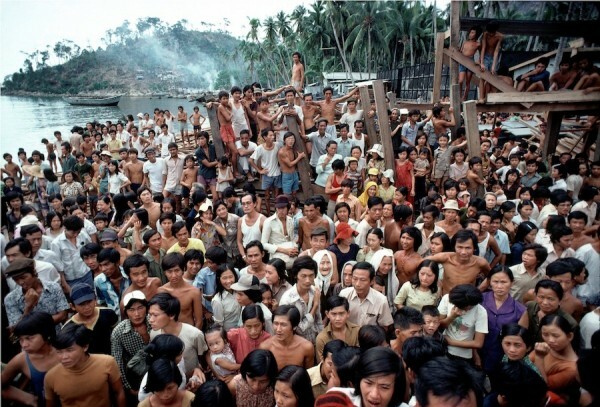 My parents’ encounter as boat people were the same, although they were refugees living on Thailand instead, headed to Hawaii then finally to San Jose, California. From nothing, my parents gave us everything they didn’t even dream about. Thank you for sharing a piece of our history. We’re accustomed to many of our friends here with having similar stories. It’s easier to forget how many people have never heard a story like this. One reason why I figured this story needed to be shared. This is such an amazing story! I can’t even imagine going through anything like that. At least 3 sets of my great grandparents moved to the US from Europe (2 sets from Italy, the other from Ireland) but they wouldn’t have experienced anything like this. I’m glad your parents and your brothers made it. Do your brothers remember anything about that time? They look pretty young in those photos, maybe a little too young to remember it. Thanks for sharing this! Like Stephanie, my grandparents and great-grandparents came to the USA from Italy but they never said much about the journey over. They did, however, tell us how difficult it was for them once they got here. But, like your parents, they stuck it out and now here we are! What an amazing story! My parents were all born in the States, but their parents all made their way to America. For the most part they had easy journeys over in comparison to this, but my grandfather from Croatia had a rough go. He escaped the army and his family paid for it. He hardly talks about it, but we know a little bit about his experience, and how bad it was. You’re parents are amazing people, thanks for sharing their story. This was an amazing read, and really inspirational. My family has long been rooted in the US, but I’ve always been interested in reading other’s stories of immigration. Your parents seem really strong, I can’t imagine going through this (especially with 2 young children)! Thank you for sharing this amazing story. What a great thing to be thankful for. I have two small boys and can’t imagine the difficulty of risking your life with your children, and even the two days and nights spent sitting in the boat with the young kids. I teach ESL in Sacramento and have many, many Vietnamese students. I have heard their stories–many of my students were in those boats! So brave. Nice of you to put it that way. Honestly, it’s the smiles, work ethic, and sense of humor of my Vietnamese students that keep me working here year after year. As others have mentioned, it’s important that you shared this story since many people don’t realize what our immigrants have gone through. We got chills reading this. Your parents are so courageous and strong. I’m sure it was incredibly difficult for them and huge sacrifices were made, but they did it for you and your brothers. What a beautiful thing to be thankful for. Thank you so much for sharing! the photos are almost as powerful as the story! thanks so much for sharing–i’m sure your parents really appreciate the fact that you recognize their sacrifices and just how difficult it must have been. This is such an amazing story, thank you so much for sharing. And the photos. Wow. Give them a huge hug and thank them again. What a tremendous story, and one that is so very inspiring. Thank you so much for sharing this, as I think so many others have a similar story. wow, powerful story… great courage. I am thankful for people like your parents who search for a better life for their family too… they are inspirational. My family left under dark times in Europe to sail to America… I have always been thankful for it. We came to the U.S. in April of 1975. I was 4 months old at the time. My parents said we came here by helicopter and landed on a big ship liner my mom believes is now station in San Diego, CA. Mom said we didn’t travel here by boat at all. That is an amazing story. I really enjoy how descriptive it was. I am half Vietnamese and my father told me the very same story about how our last name changes from generation to generation. It apparently ended with me, his father’s last name was Nguyen and we are both Vinh. Wild, never really put any real stock into it. Thanks for sharing your tale.